Adult supratentorial low-grade gliomas (LGG) cover a spectrum of neuropathologies that invariably present with seizure disorders. Following neuroradiological diagnosis management strategy will be determined by prognostic indicators such as patient age, lesion size, lesion location, clinical performance status and radiological differential diagnosis. Conservative management, characterised by a “watch and wait” policy, with serial neuroimaging and clinical observation, may form an integral part of overall Multi-Disciplinary Team management strategy in many patients. Conservative management may include the periods following radiological diagnosis to primary surgery, and from the time of surgery to timing of radiotherapy or chemotherapy. 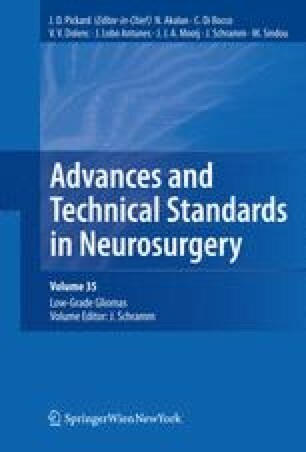 Results from randomised controlled clinical trials in LGG, recent findings following microsurgical excision, findings from serial observations using volumetric MRI, and recent findings following chemotherapy and tumour genotyping have helped in defining the place of conservative management in individual cases. These recent findings have moved conservative management from a ‘controversial’ legacy of a bygone era to a more objectively based coherent management component that is understood by both medical and surgical neuro-oncologists. However there is still no evidence from randomised controlled trials to either support or indict the role of conservative management, prior to primary intervention, in LGG. Informing patients of the uncertainties in both interventional strategies and the place of conservative management in LGG is essential in optimising patient outcomes and satisfaction.